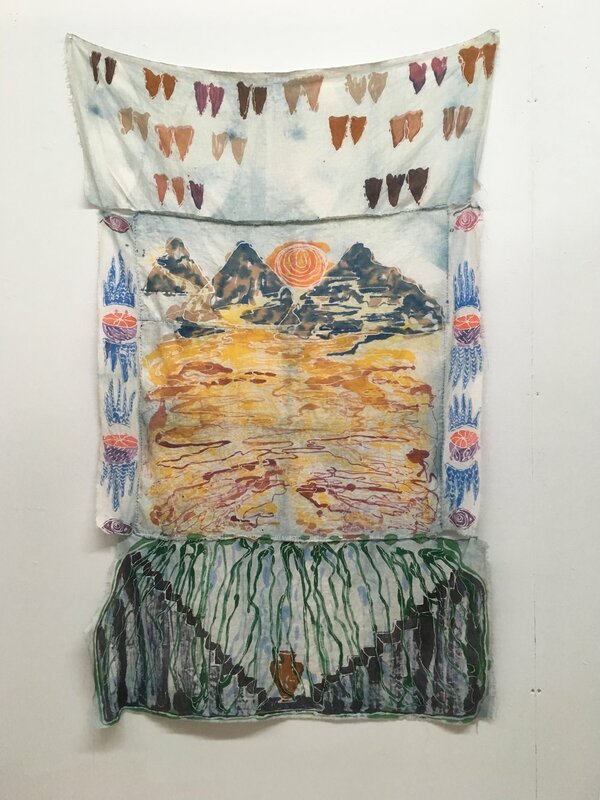 Padma Rajendran, Original Shell, 2016, dye and resist on silk, 52 x 54"
Ortega y Gasset Projects is pleased to present Among Nines, a solo exhibition by New York-based artist Padma Rajendran. Rajendran is the recipient of the Ortega y Gasset Projects Summer Residency + Solo Exhibition Program. There will be an opening reception on Saturday, September 9, 6-9 PM. The exhibition runs through Sunday, October 1st. This exhibition is curated by the Co-Directors of Ortega y Gasset Projects, and opens concurrently with Jihyun Hong’s site-specific installation $1.99 cat, green wendy in The Skirt. 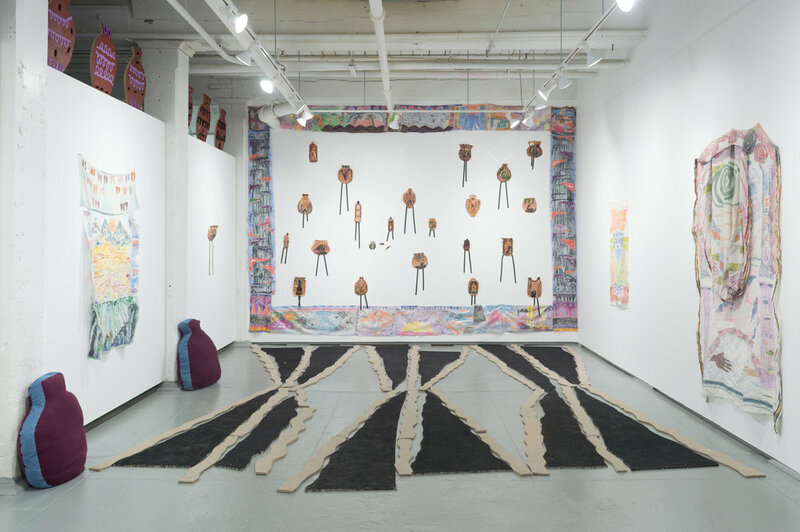 Among Nines is Rajendran’s debut solo exhibition in New York and presents work made as the artist-in-residence at Ortega y Gasset Projects. Working on fabric, Rajendran applies resist and dye to achieve both crisp edges that reflect her drawings and faded colors that infer atmospheric haze. Her diverse imagery includes food, domestic tools, architecture, landscape, and abstract patterning that all synthesize into a “story cloth”: a traditional mode of narrative through textile. Rajendran presents her fabric works in the context of ceramic pieces as installation that activate peripheral spaces and the floor of the gallery. Rajendran’s work comes from an interior place of living two cultural lives and manifests from digging through the past of personal monuments and archived histories. Gathering these symbols authenticates the forgotten and resurrects it to be experienced again. It is a path to observe an alternate unfolding of events and offers a new ontology. Her imagery is talking to the ritualistic narratives specific to her shell and shelter. Recollecting these souvenirs and events, she embraces the idea of the woven to create images that instigate psychological elasticity yet are still bound by opposing threads. Padma Rajendran was born in Klang, Malaysia. She received her BA from Bryn Mawr College in 2007 and received her MFA in Printmaking at Rhode Island School of Design in 2015. She currently lives and works in New York, NY. She has exhibited at the International Print Center New York, Kleinert James Center for the Arts (Woodstock, NY), the Strohl Art Center (Chautauqua, NY), the Warwick Museum of Art (Warwick, RI), and recently at Whitespace Gallery (Atlanta, GA).